With a "barrage" of ideas and activities will celebrate the 441st anniversary of the Battle of Lepanto in the organization of the Municipality of Nafpaktos. 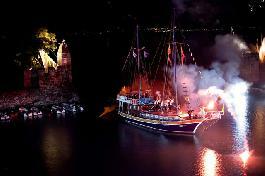 From 6 to 14 October 2012, Nafpaktos offers visitors an experience that will combine the "business with pleasure". "The October 1571, when hundreds of galleons, thousands of men, including the leading Spanish writer Miguel de Cervantes, participated in the Battle of Lepanto, affected the whole of Europe, politically and spiritually," explains Mayor of the Municipality of Nafpaktos, principal John Bull and said: "He beat the historic event we wish to convey to the visitor the celebrations with a multifaceted program that has substance." A peaceful "battle" in the magical waters of Lepanto will mark the beginning of celebrations of the Battle, Saturday, Oct. 6, by performing yacht race. Followed photography exhibition theme the fascination with the region. Artistic, but also 'militant' disposal will have Sunday, October 7 with report of rare paintings and engravings of the collection of L. Makriyannis. The week that follows will be peppered with studies, speeches and lectures by distinguished members of the research and academic community, such as N. Moschona, groups. Research Director EPC, C. Gaspari research director EPC, M. Duru - Iliopoulos, Professor, University of Athens, M. Koumanoudis, researcher EPC, F. Perri tutor University of Peloponnese, L. cob, historical Minister Dr. Pan / University of Athens, I. Chasioti group. Professor University of Thessaloniki. On Friday, October 12, inaugurated a photo exhibition on the rich collection of 22 Inland Revenue Byzantine and Post-Byzantine antiquities. The same day promises exciting moments with the parade of "ARMA HELLAS" and fencing demonstration in the picturesque harbor of Lepanto. This Saturday, October 13 at noon will be "fighting" strategy in the fourth tournament chess Gribovo the beach and in the evening at 20.30 in the picturesque Venetian port of Nafpaktos will follow a spectacular representation of the Battle. The festivities concluded Sunday, October 14 with an impressive peal, the Episcopal service and traditional procession of the Holy Cathedral of St. Demetrios in the historic port of Nafpaktos.